A wall is an important part of a house that can never be ignored. Wall space is important to bringing a room together, and the amount of items and what you use will complete the overall look you need. The use of wall art is a great way to add some style to your room and really give your house a touch of beauty. 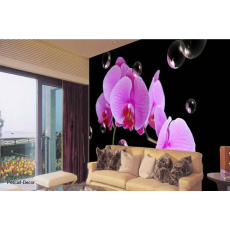 If you have a lot of blank space on your walls and you are wondering how you can fill it, flowered mural can come into play and really help you enhance the beauty of your house. Bored with your walls? Wall murals are a great way of decorating living rooms, bedrooms, ceiling and other interior spaces. If you want to bring a unique style on the wall, a pink wall mural could be the best. Wondering where you can purchase affordable and superior wall mural? Petcarl Décor is a reliable shop that you trust to help you.